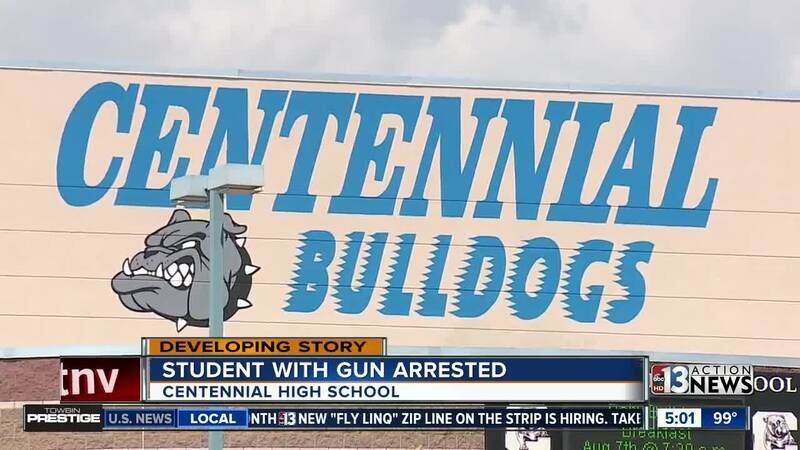 A student was arrested Wednesday morning for having a loaded gun on campus at Centennial High. Austin Carter reports. A 16-year-old student with a gun was taken into custody at Centennial High School on Wednesday morning, according to Clark County School District Police Department. The arrest happened around 10 a.m. School administration received a tip from another student and they called the school police. The student was removed from a classroom without incident and was found to be in possession of a loaded 9mm handgun. It is not known at this time why the student had a gun at school. The student is facing a charge of possession of a dangerous weapon on school property. Centennial High School is located near West Centennial Parkway and North Hualapai Way.